The Davis assessment allows us to find out if you are likely to benefit from our programme, and design a tailor-made programme just for you. Through the assessment we create a unique symptoms profile, highlighting both your strengths and weaknesses. 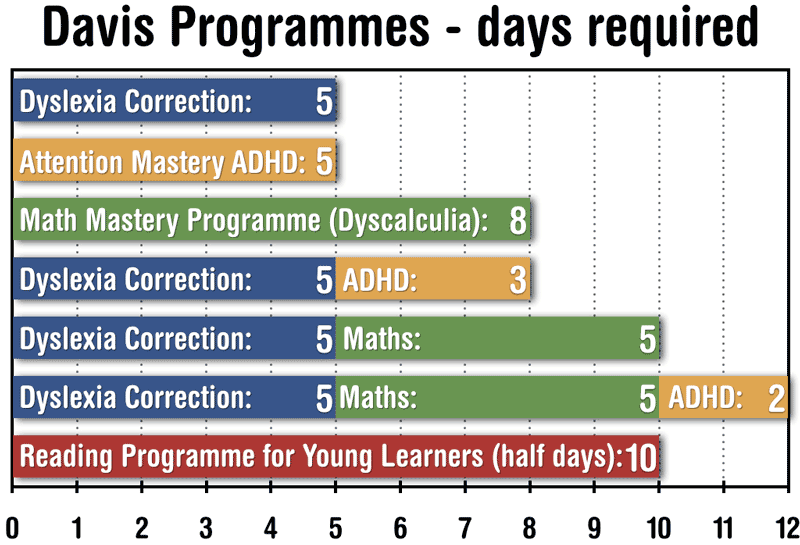 Is the programme right for you? Are you likely to benefit from our help? Do you really want our help (not just your parents)? Am I the best person to work with you (rapport is very important)? The result of the assessment is discussed at he end, but we do not provide a written report. If you are looking for a written report, we recommend a full educational assessment, which we do not provide, but we provide a list of educational psychologists for this purpose on a separate page. Even if you decide not to go further with our help, the Davis assessment is likely to give you a much greater understanding of the problems you are facing as well as a more positive outlook on the world. If our Davis assessment indicates that you would benefit from using the Davis methods, you can at your leisure decide to sign up for the full thirty hour correction programme. You may want to do the free on-line Davis assessment right now, which will give you an immediate indication of whether our programme is likely to benefit you. © 2019 DDAA All Rights Reserved. Professional services described as Davis™, including Davis Dyslexia Correction®, Davis™ Symbol Mastery, Davis™ Orientation Counseling, Davis™ Attention Mastery, Davis™ Math Mastery, and Davis™ Reading Program for Young Learners may only be provided by persons who are trained and licensed as Davis Facilitators or Specialists by Davis Dyslexia Association International. Davis™ Learning Strategies is a trademark of Ronald D. Davis. Commercial use of this trademark for the purposes of training and mentoring teachers requires licensing by the trademark owner. Davis™, Davis™ Autism Approach, Davis™ Stepping Stones, and Davis™ Concepts for Life are trademarks of Ronald D. Davis. Commercial use of these trademarks to identify educational, instructional, or therapeutic services requires licensing by the trademark owner.